As part of dissemination and exploitation activities, all partners organised, at least, 2 rising awareness workshops each for stakeholders. The first one was intended as an awareness rising event, the second one was planned at the end of the project, when the final product and the results of the pilot testing activities could be presented. Projects workshops have been disseminate through the corporate web of partners. Each project partner has adapted dates and content of workshops to local target group and situations to achieve an effective spreading of project key messages. More than 200 attendants participated at the workshops: personal assistants, doctors, VET trainers, VET students, representatives from employment offices, NGO’s, HR people, decision-makers, other relevant stakeholders, general public and experts. It is important to remark that workshops were also a vehicle for further dissemination of the project. Invitations sent to the participants were more than 4.500 and news launched through newsletters and other media reached more than 7.000 persons/organizations. 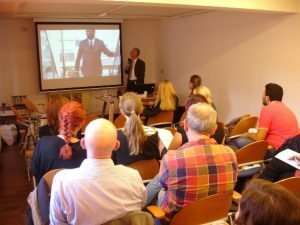 News and pictures of rising awareness workshops were published on Facebook and corporate web of project partners. This activity has been in a successfully manner. More workshops than originally planned have been done, adding the diversity of target groups and subjects addressed which it guarantees an effective dissemination of the project main products and results. 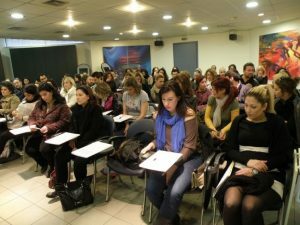 The awareness raising workshop which was organised in the frame of the European project PR-ERF: Practical Methodology for Acquiring Key Competences of European reference framework through Continuous Vocational Education and training took place at the premises of DIMITRA facilities in Larissa on Wednesday, 29th of October 2014 was successfully completed. The purpose of the workshop was to disseminate the project among the local society and to fully inform the local authorities and the business world about the benefits of the PR-ERF implementation. The key theme during the workshop was the presentation’s session of local stakeholders and experts of VET sector, where through personal experiences, described the importance of the Key Competences as a package of Skills, Knowledge and Attitudes that all individuals need to acquire for personal fulfillment, development, inclusion and employment in a continuous changing environment. It is worthy to be mentioned that participants in the workshop were representatives of local society, VET trainers, decision-makers, and general public. At the end of the workshop an open dialogue took place where participants had the opportunity to discuss with the local experts and to present their thoughts and their concerns. As part of dissemination and exploitation process two workshops for stakeholders will be held in each participant country in the project. The first one, an awareness rising at the beginning of the project, the second one, a final transnational workshop for main stakeholders and decision-maker that will be held in Spain at the end of the project (October 2015).